While working as a dancer in a nightclub, Rusty Parker (Rita Hayworth) hears about a contest being run by Vanity magazine to find a new face for their big fiftieth anniversary issue. She goes to audition for Cornelia Jackson (Eve Arden), who isn’t impressed by her, but she does catch the eye of publisher John Coudair (Otto Kruger). Cordelia doesn’t know what he sees in her, but it turns out Rusty is a dead ringer for a woman he had been in love with forty years earlier named Maribelle Hicks. When he finds out that Rusty is Mirabelle’s granddaughter, she wins the magazine cover. When her magazine cover hits the newsstands, Rusty becomes a local celebrity. Her boyfriend Danny McGuire (Gene Kelly), who also owns the nightclub she dances at, is glad to see Rusty’s dreams coming true, but he wishes she were becoming famous as a dancer instead of being just a pretty face. He’s also afraid her newfound success will drive her away from him. Thanks to Rusty, Danny’s nightclub suddenly becomes the hot place to be and one person who comes to see her is Noel Wheaton (Lee Bowman), the owner of a theater on Broadway. He wants to put her in a show, but she doesn’t want to leave Danny’s club. Noel and Coudair won’t to take “no” for an answer and keep trying to get Rusty to come to Broadway, which continues to drive a wedge between Rusty and Danny. Eventually, Danny decides the best thing he can do for Rusty is let her go. She finally goes off to Broadway and becomes a big star while Danny and his best friend Genius (Phil Silvers) close up the nightclub and head off to entertain the troops. Before too long, Noel proposes to Rusty and although she doesn’t love him, she reluctantly accepts since Danny is gone. When Danny hears about her engagement, he decides to make one last attempt to win her back. Cover Girl is the best musical MGM never made. It’s got Gene Kelly, great Gershwin songs, nice bright Technicolor, and is just pure, exuberant fun. This is one of those movies I can put on when I’m having a bad day and it will never fail to cheer me up. 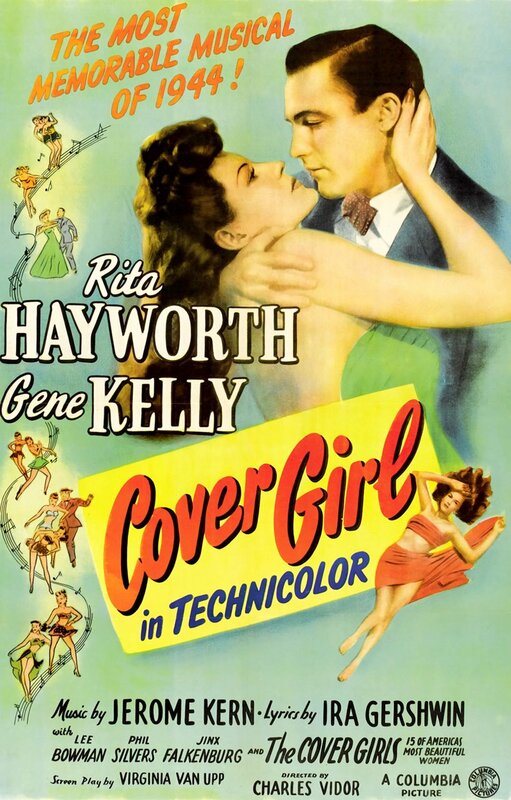 Cover Girl came pretty early in Gene Kelly’s career and I think it’s one of his more underrated films. I’ve always been a huge fan of the “Alter Ego” dance scene where Gene dances with himself. It’s too bad this was the only movie Gene made with Rita Hayworth; I really would have liked to have seen them together again. What’s really remarkable about Cover Girl is that even though Gene had been only been making movies for two years, he was given a lot of creative control over it. Maybe that’s part of the reason why I have a tendency to forget it was made at Columbia, not MGM. Lovely post, Angela! I adore this film, too. 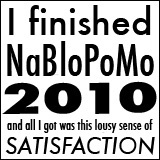 It’s such a feel-good story, and that Technicolor! It’s just a true joy to watch. One of my favorites, and it’s always looked to me like Silvers, Kelly and Hayworth had a great time together making it. I love your description of this move as “the best musical MGM never made”. I keep forgetting, too, that some great musicals were made at other studios.